As a recognized leader in the Natural Gas & Oil industry, Van Ness Feldman provides comprehensive services to the companies operating in the areas natural gas, LNG, oil, and refined products. We advise clients at every stage of the oil and natural gas infrastructure development process, including pre-development, project structuring, development, permitting, construction, operation, expansion, continuing regulatory compliance, and ongoing transactional services. Van Ness Feldman brings a deep bench and the breadth of experience, knowledge and resources to helping clients manage the complex legal, policy, and grass roots issues affecting the development, construction and operation of energy infrastructure. We represent clients in rate, tariff, certificate, and enforcement proceedings at FERC; pipeline safety compliance and enforcement at PHMSA; energy transactions; state and federal environmental permitting and litigation; tribal consultations; energy import and exports, regulation of energy derivatives trading, climate change issues, and greenhouse gas emissions. 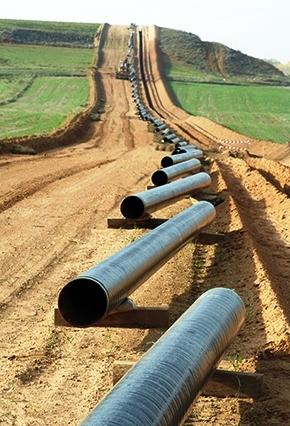 Pipeline market conditions constantly shift, as do the policies and priorities of regulatory entities, such as the Federal Energy Regulatory Commission (FERC), the Department of Energy, and the Pipeline and Hazardous Materials Safety Administration (PHMSA). The firm’s unparalleled regulatory practice helps pipeline clients anticipate and respond to these changes and offers the expertise of former FERC and PHMSA officials to address clients’ regulatory compliance, policy, and litigation needs, consistent with their business objectives. Van Ness Feldman assists clients in preparing open season documents, tariff changes, adoption notices, cost of service, commercial agreements in support of operations, and indexed and market-based rate filings. The firm’s attorneys also develop and implement litigation and corporate strategies, prepare testimony, and represent clients in rate cases and appellate proceedings. The firm’s pipeline attorneys advise clients at every stage of the pipeline infrastructure development process, including pre-development, project structuring, tribal and other stakeholder consultation, permitting, construction, operation, expansion, continuing regulatory compliance, and ongoing transactional services. Each project presents unique challenges in financing, permitting, construction, political considerations, and stakeholder management. Van Ness Feldman approaches each project strategically, bringing to bear unparalleled substantive legal expertise, a results-oriented understanding of our client’s business goals, and intimate familiarity with the impacts of energy and environmental policy and regulation on energy projects of every size and scope. Van Ness Feldman’s pipeline attorneys have extensive rate case experience that includes representing clients under both Sections 4 and 5 of the Natural Gas Act (NGA) and under Section 311 of the Natural Gas Policy Act, from the perspective of the pipeline as well as the customers. As a result, the firm brings an appreciation of multiple perspectives to the representation of clients in rate proceedings. Because of Van Ness Feldman’s extensive experience in both rate cases and other regulatory matters impacting natural gas pipelines, attorneys possess unique insight into the business of running a pipeline, including extensive knowledge of Master Limited Partnerships (MLPs), which allows the firm to deal successfully not only with the typical rate case issues, but also with larger policy issues that may arise in the course of a rate case. Van Ness Feldman is respected as a forceful but fair advocate that can litigate effectively but also negotiate reasonable settlements of proceedings. .
A list of our recent rate case successes can be accessed here. Van Ness Feldman has assisted natural gas clients for nearly 30 years in protecting their corporate integrity. The firm has over 40 attorneys whose practices focus primarily on federal energy regulatory compliance issues. Van Ness Feldman has experience in all aspects of a federal energy compliance practice, from conducting regulatory compliance reviews, to helping clients develop compliance plans and training programs, to defending clients in FERC audits, investigations, and enforcement actions. In particular, the firm has experience counseling and representing clients with respect to regulatory compliance reviews, compliance programs and procedures, audit committee counsel, audit/investigation/ enforcement response counsel, leadership seminars for management, and compliance maintenance services. Van Ness Feldman provides a full range of pipeline safety services for operators of gas and liquid products pipelines and LNG facilities. The firm provides regulatory guidance on real-life compliance questions; defends operators in enforcement proceedings; advises in litigation proceedings; reviews compliance plans and helps prepare for audits and inspections; leads internal investigations; provides policy guidance on rulemakings and legislation; helps develop regulatory strategies for using new materials and technologies; and assists with special permit applications and implementation. Van Ness Feldman partners with pipeline personnel to help balance safety objectives and business and legal risk and protect and preserve legal rights. The firm’s pipeline safety practice is anchored by attorneys with long-standing experience in the pipeline industry and pipeline safety expertise at PHMSA. We combine these capabilities with Van Ness Feldman’s established and respected pipeline practice and industry knowledge to help operators develop, implement and defend their safety programs. Backed by a strong litigation team, the firm also helps operators effectively respond to and manage administrative enforcement actions and, when necessary, litigation. Van Ness Feldman is home to one of the most experienced and seasoned LNG practices in the country, and the firm’s professionals have been at the forefront of every major development in the LNG industry since the 1970s. Van Ness Feldman’s clients are involved in virtually all aspects of the LNG industry and include LNG project developers, terminal operators and owners, suppliers, natural gas pipelines and storage companies, trading companies, investors, and lenders. LNG attorneys advise clients on various parts of the LNG value chain, including pre-development, project structuring, development, permitting, construction, operation, and expansion. The firm also provides due diligence review for prospective lenders and investors, and offers a full range of transactional services. In addition to regulatory and transactional experience, the LNG team also provides strategic advice on public policy affecting LNG projects as well as legislative advocacy. Crude Oil Swaps with Mexico: Is the Export Ban on its Last Legs?